Cheshire. Cheshire is one of the most picturesque counties in Britain; it is situated in North West England and has excellent rail and motorway connections making it incredibly easy to get to. Black and white 'Magpie' houses set in idyllic gardens typify the Cheshire countryside. Its green pasture lands and farms are renowned for the production of the famous crumbly white Cheshire cheese. In the heart of this beautiful county you will find an abundance of hacking opportunities including the Bishop Bennett Way, Delamere Loop, Delamere Forest, Whitegate Way, Marbury and Tatton Park. We recommend riding with the following BHS approved stables (click here). Harrogate. The historic county of Yorkshire is considered to be amongst the greenest in England due largely to the vast stretches of unspoilt countryside of the Yorkshire Dales, North York Moors and parts of the Peak District. Situated in an area of outstanding natural beauty close to Nidderdale our recommend BHS approved riding stables is stone’s throw away from Brimham rocks, Fountains Abbey, Ripley and Harrogate. 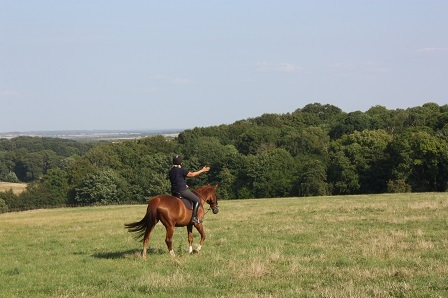 Here you can enjoy direct hacking out along the picturesque bridleways taking you across an extensive area of natural and unspoilt North Yorkshire countryside. 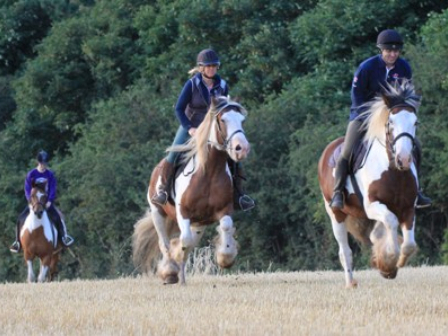 Yorkshire is the largest county in the UK and as such is brimming with things to do for all the family meaning it’s an ideal location for non-riders and riders alike. Wiltshire. The West Country stretches from Bristol in the North to Bournemouth on the South coast. The area between offers some truly exceptional riding experiences including the privately-owned Rushmore Estate. Just 2hrs outside London and 1.5hrs from Bristol and Bournemouth you will find the breath-taking Rushmore Estate. Here you can ride through the spectacular Beech avenues, observe the deer in the valleys and absorb the stunning views across the Cranborne Chase. The estate woodlands contain one of the largest blocks of semi-natural broad-leaved woodlands in the South England, and in the last 10 years has seen a major restoration programme and the woods are now recognised as a wildlife site of National importance. We recommend riding with the following BHS approved stables (click here). Shropshire. Conveniently located in the centre of England, Shropshire is within a few hours drive of many of the major cities and has easy access from the M6, M5 and M54 motorways. The county's rural landscape provides excellent riding through fields, woodland and along the River Severn. You can trace the footsteps of the famous Shropshire horseman Jack Mytton as you ride along his bridleway The Jack Mytton Way. Click here for our recommended accommodation and stables. The Lake District. The Lake District is located in the North West of England and is mainly famous for its lakes, forests and mountains (or fells). Here you will stay in a traditional Lakeside house overlooking Winster and Lyth valley. You will also have the opportunity to ride over 2500 acres of private estate land which comprises of miles of secluded woodland tracks. Bring the whole family, riders and non-riders are welcome, bring your bike and dog too if you like! Click here for our recommended accommodation and stables. Sherwood Forest. Visit Nottinghamshire for a short break and explore the famous home of Robin Hood and Maid Marian on horseback. Set close to the archaeological beauty spot of Creswell Crags, the yard itself, including the stables, date back to 1610. From here you can hack directly into Sherwood Forest, with rides ranging from half hour hacks to three and four hour forest trail rides all with limited to no road work. Click here for our recommended accommodation and stables.